BRITISH QUAD ORIGINAL MOVIE POSTER. For 1000's of Vintage Movie Posters. We sell more vintage original STAR WARS posters than anyone in the galaxy! 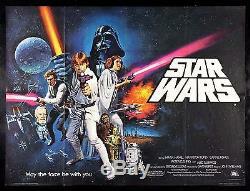 To view our entire STAR WARS inventory. A long time can go by without one of these coming up for sale. You will have trouble finding a nicer one. Tiny 1/8" hole in the "W" in "STAR WARS. If a vintage poster is in terrific unrestored condition like this one (EX C8 or better), many experienced collectors will place a premium on it (when compared to a linen backed/restored one). Most experienced collectors prefer unrestored items to restored ones because they believe they will appreciate more in value. C7 Very Good to Excellent - Fine condition. Still a very nicely preserved item. C6 Very Good - The typical used poster in average condition. C5 Good to Very Good - A heavily-worn item. C4 Good - Below average but still suitable for display. C3 Fair - Heavily worn, but yet still complete. C2 Poor to Fair - An extremely worn, possibly even incomplete item. C1 Poor - The lowest grade, representing items in the lowest possible condition. Some of our posters are "between grades". For example, a C8-C9 poster will contain all the qualities/characteristics of a Near Mint C9 except for one or two very minor flaws that we believe prevent it from being a true C9. Sometimes it isn't possible to do this. Sometimes we can't roll a folded poster. For more information about CineMasterpieces please see. We guarantee that all posters we sell are graded and described accurately. Unless otherwise specified in the description, ALL POSTERS ARE ORIGINAL MOVIE POSTERS original theatrical movie posters that were displayed or meant for display (unused) in theaters at the time the movies were released. We will put in writing that we guarantee it to be an Original Movie Poster. The item "STAR WARS UK BRITISH QUAD CineMasterpieces RARE ORIGINAL MOVIE POSTER 1977" is in sale since Tuesday, November 15, 2016.